Eurodollar has almost reach target area to complete current correction. Possibly, bulls aren’t strong enough to continue pushing price upwards, that’s why I’m starting to sell very carefully with stop placed above level of 61.8%. As we can see at H1 chart, pair reached one of temporary fibo-zones, thus increasing possibility of reverse. Otherwise, if market breaks level of 61.8% and keeps price above it, bulls will continue pushing pair upwards. Franc is also moving above level of 61.8%, but latest price bars imply that bears may not be strong enough to reach their target levels. That’s why I’m buying very carefully with stop placed below predicted target area. 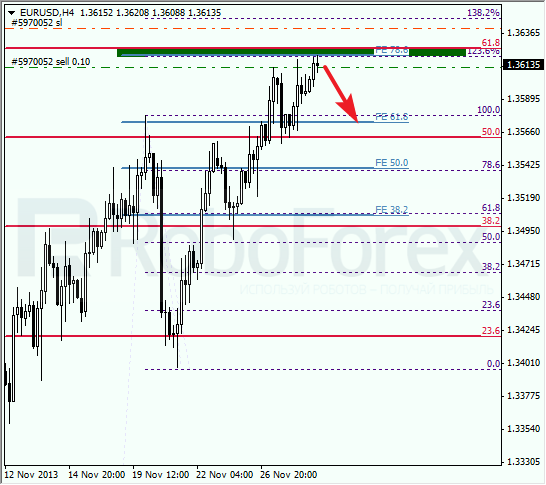 At H1 chart, pair reached temporary fibo-zone and right now is trying to rebound lower border of current trading range. I’ll move stop into the black right after price starts growing up. If pair breaks local maximum, I’ll increase my long position.